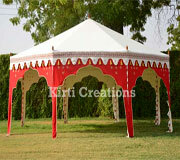 Garden tents are made of fine quality material and are attractive, stylish as well as spacious. They are suitable for small gatherings, wine and dine. It is very easy to set up during the garden functions and are waterproof also it protects from harsh weather conditions. These tents are durable, sturdy, highly spacious and efficient in nature. Available in different designs, styles, patterns and colours, Garden tents are perfect for outdoor activities like picnics, camps, outdoor parties and functions. Easily installed and exceptional in design, this Monolithic Garden Tent is ideal for hosting any type of event. Maroon and white color along with aseptically designed top border makes these Monolithic Garden Tent look attractive and spell bounding.